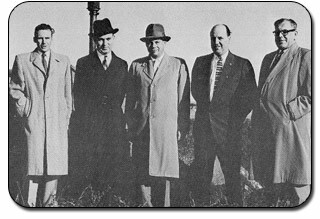 In the mid 1951's five individuals in Summerside united to form a company and entered into the Real Estate business. These were W. Chester S. MacDonald, a young lawyer commencing practice in the Summerside area; Hubert B McNeill, general practitioner practicing medicine; G. Lorne Monkley who was secretary-treasurer of Amalgamated Dairies; Keith Pickard who was a local architect, and Henry W. Wedge who was former Mayor and a Pharmacist and owner of Enman Drug Store. These people from five different walks of life got together and formed Hillcrest Housing in 1958 and immediately started to develop housing in the Summerside area. Essentially at first for the use of Department of National Defence personnel stationed at CFB Summerside. Today Hillcrest Housing manages over 430 units in the Summerside area.